Measuring happiness and wellbeing is all the rage among national statisticians, writes Anthony Reuben. In its latest release on the subject, the Office for National Statistics (ONS) compares how happy British people are with how happy people are in the other 27 countries of the European Union. This is terrifically important, because it's not about how happy you are - it's about whether you're happier than the neighbours. The key headline measure is what proportion of people rated their satisfaction with life as more than seven out of 10. In the 2011 European Quality of Life Survey, the UK came 11th out of 28, with 71.8% of over-16s saying they were that satisfied. 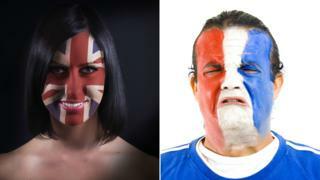 That put the UK slightly higher than the EU average of 69.3% and a hair's breadth above France in 12th place on 71.6%. For the record, Denmark, Finland and Sweden occupied the top three spots, with Greece, Hungary and Bulgaria in the bottom three. But it wasn't all good news from a British perspective. On the question of whether they could get support from friends or relatives if they needed advice about a serious matter, the UK came twenty-sixth with 88.7%. On the plus side, the UK was still ahead of France, which came last with 86.1%. Perhaps surprisingly, the report also looked at how good people were at maths, on the basis that there was a positive relationship between education and well-being. Based on figures from 2012, the UK came in 13th. And that put us behind France, in 12th. So what have we learned? People in the UK are slightly happier than the French and have marginally more people to turn to in a crisis, but the French are a touch better at sums.